Power factor is the ratio of real power (kW) to apparent power (kVA). This ratio can be a value from 0 to 1, and it indicates how efficiently an AC circuit is using electricity, with a value of 1 representing high efficiency. The third type of power, called reactive power (kVAr), causes electronics to be inefficient and draws the ratio closer to 0 by creating a difference between real power and apparent power. 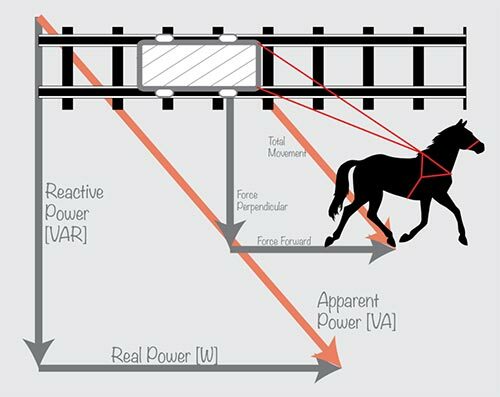 In AC circuits, inductive components (capacitors, motors, compressors, etc…) prevent the “horse” from running directly in front of the cart, which increases the reactive power and increases the difference between real and apparent power. The result? A greater difference between real and apparent power and a lower power factor.